Libby's Little Addiction: March My Monthly Hero release blog hop! March My Monthly Hero release blog hop! Hello! Today another fabulous kit is releasing over in the Hero Arts store. You should have landed here from the blog of one of my favorite people, Mariana Grigsby! If you didn't, be sure to head back to the Hero Arts blog and learn more about this awesome kit! This month's kit was a collaboration with Marianne Walker! 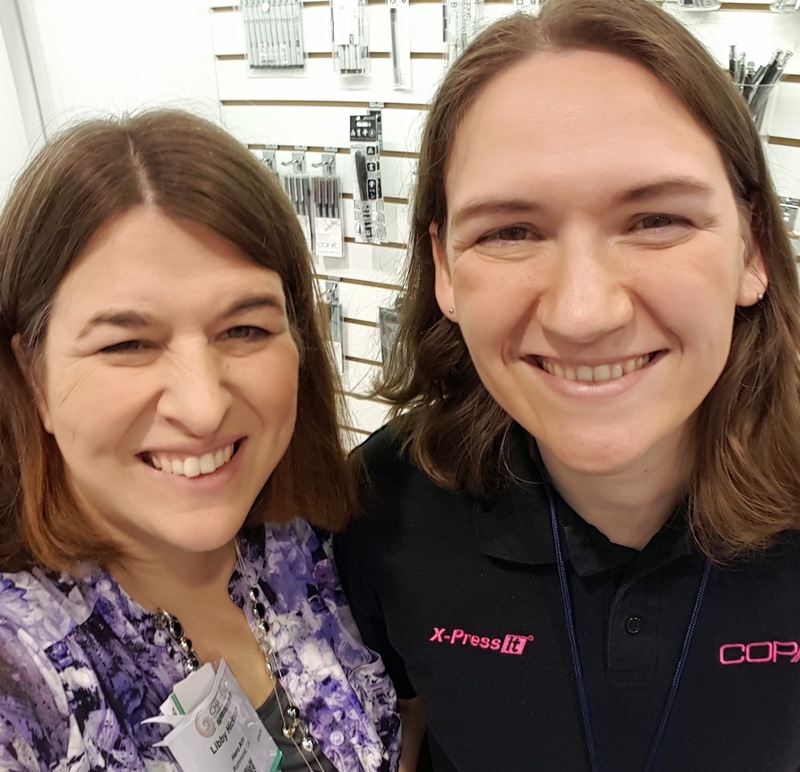 If you don't know Marianne, she is the queen of Copic markers! Her coloring is amazing. She's a super talented artist. And she's incredibly nice. I'm so thrilled I got to work with her on this kit!! The main kit contains some coloring cards drawn by Marianne. They are so much fun to color!! I colored a couple of them, they are on the homepage slider and kit landing page over on the Hero Arts website. Another cool thing about the kit is that there are stamps & dies included - and the stamp images match some of the images in the coloring cards! So if you want, you can color the card, and then stamp an additional image, color it in, die cut it out, and add it to your card! FUN!! Or, you can just do what I did on these cards, and use the stamps on their own, without the coloring cards. This is another little blossom stamp in the kit. 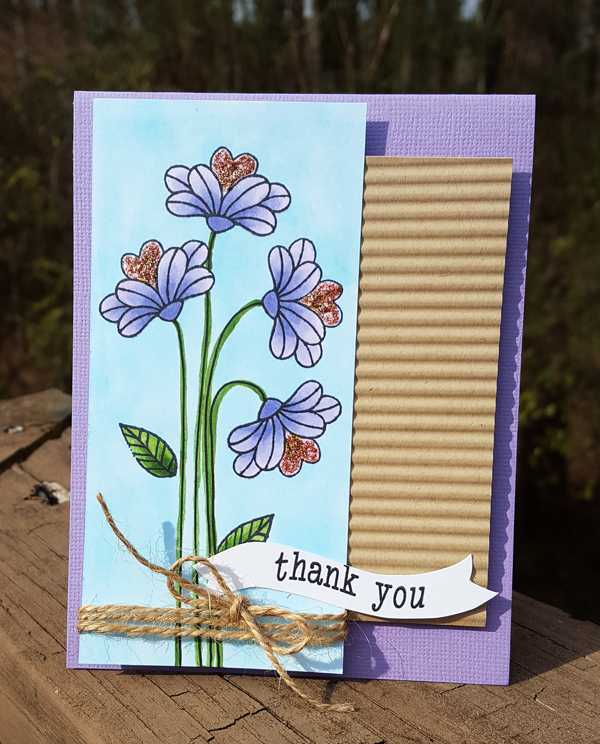 I drew in the long stems by hand, then stamped the cute little leaf that's in the stamp set. So who still has their corrugator? I am determined to make that tool have a crafty comeback - I love the look of corrugation! 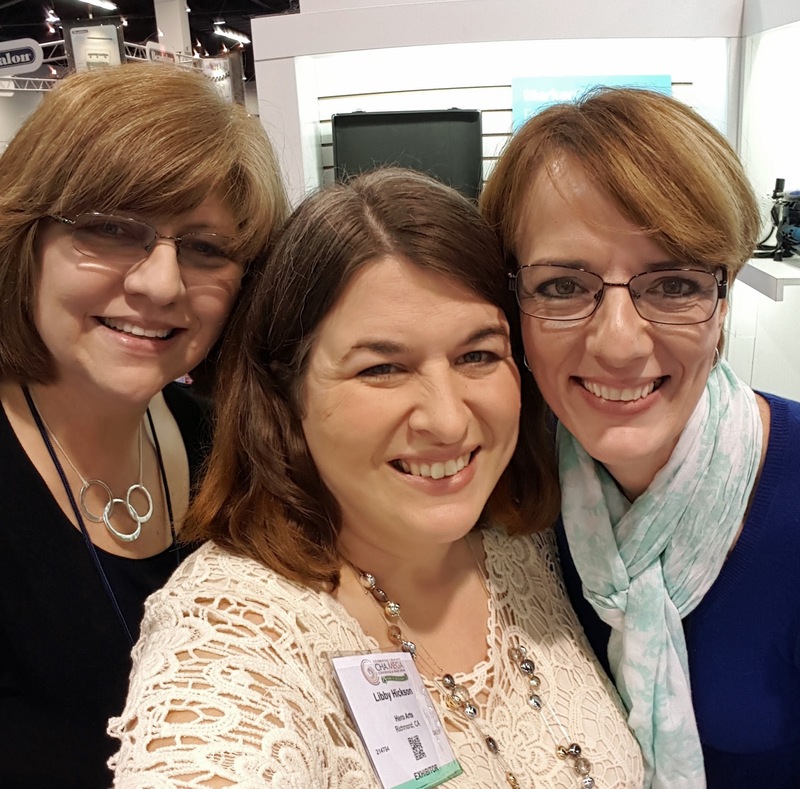 I'm in the launch blog hop with some of my favorite coloring professionals on the planet. Seriously, they are my stamping idols, and I'm kind of freaking out a little. In fact, I almost want to run and hide somewhere because I really cannot hang with these ladies. But alas, here I am. HA! 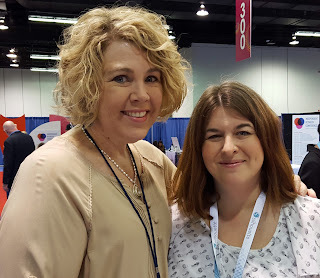 So why don't you visit their blogs, leave some love - and while you're at it, you'll be entered into the drawing for one of two awesome prizes - either an MMH kit, or a prize pack put together by Marianne herself. Before I go, I have to share one more thing. When I was in Anaheim for the big Craft & Hobby Association tradeshow in January, I got to get my photo snapped with a few of these amazing ladies. Yes, I am the stampy paparazzi. It was such a thrill to see all of them!! Here I am with Cindy and Debbie. I was trying to get their coloring skills to rub off on me. No such luck. This is with Lori (yikes I look exhausted!). And here I am with the kit artist herself - Marianne. YAY!!! It was so much fun to say hi to all of them. Now be sure to head on over to the Hero Arts store and pick up your kit HERE!! Beautiful cards! Can't wait to get this kit. Thanks for sharing. 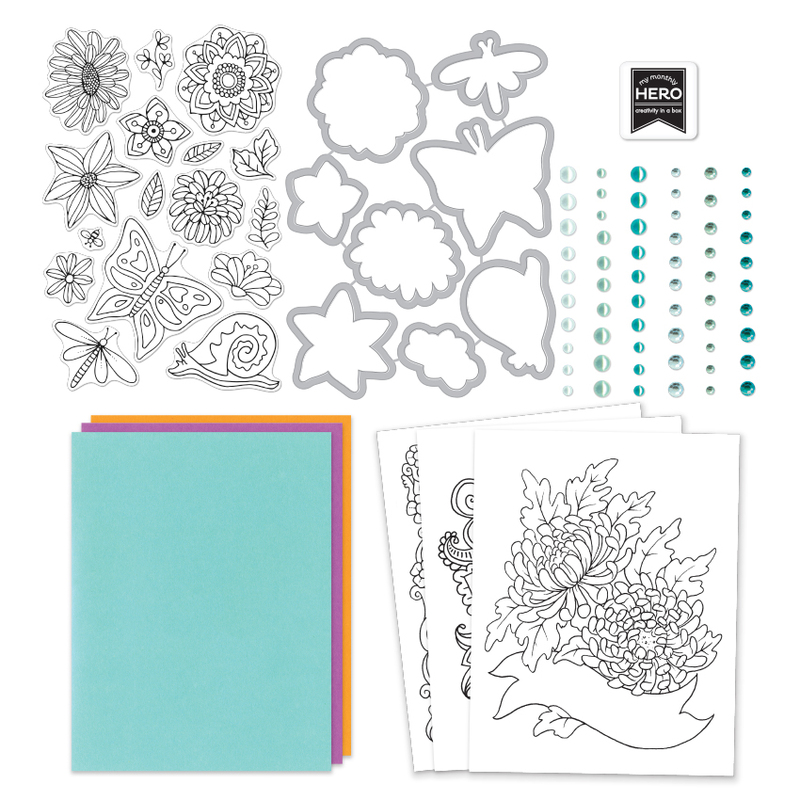 Beautiful flowers and awesome coloring on your lovely cards! Love this gorgeous kit... so many possibilities! Great kit, beautiful cards...thanks for showing coloring techniques other than Copic! Beautiful cards! Love the watercolor flowers! I love both your cards and it was great to see a card made using watercoloring. I love the look you created with the water colours! Two beauties...the purple is MY favorite, of course, but I also love the water-colored flowers! And I'm so pleased that the website and my order went through perfectly...YAY! I know you worked so hard on all the issues last month, so this is Pure Joy all of you at Hero! YAY!! Cute, cute cards. Love the colors. Thanks for the inspiration. Beautiful cards, Libby! 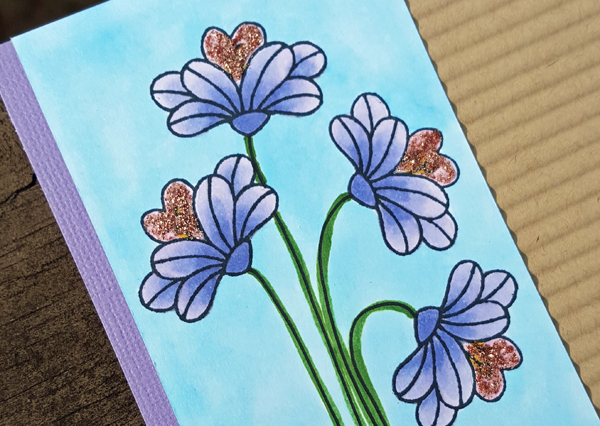 I love that on the first card you showed how great the flowers look with water color! Okay, forget the cards. How fun was that to meet and take a picture with them? Very nice. Okay, back to the azaleas. We have tons in Florida. I love the pink ones just like the one you slapped some paint on. Great! Both cards are beautiful, azaleas or not. Beautiful cards, I especially like the watercolour effect you put on the first one!! Thanks for sharing the wonderful photos!! Such pretty cards! I am loving this kit! Yeah! Love it. Absolutely beautiful cards. I don't know why you don't think your coloring is amazing, because it is! Thank you for the inspiration. So very pretty, both of them. I love your color choices. Both cards are lovely and showcase the flowers wonderfully! Both your cards are beautifully crafted!!! Love both cards but second is my favorite. It was such a wonderful hop, Libby! So much beautiful inspiration along the way! I absolutely adore both of your beautiful designs, perfect for spring! Gorgeous coloring pages on the website too! Love your cards especially the watercolor. But both are so pretty. It's great to switch it up! This kit is just fantastic! Gorgeous card! Love the kraft accent on the second card! Libby, you do belong with these talented ladies. Both cards are gorgeous but my favorite is the first one with the embossed/watercolored azaleas. Great hop and cool kit! so lovely! you can hang with these ladies! Oh Libby you really under rate yourself - love your cards, particularly the second one! I love your cards!! Yay for corrugated paper!!! Beautiful!! Love your cards, specialy the one with the white flowers! 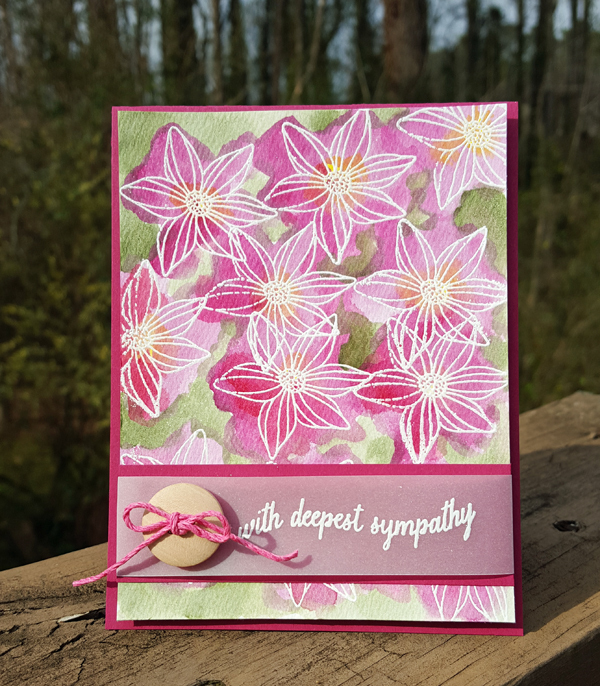 Lovely sympathy card and the way you have painted them, they do remind me of azaleas. These are both gorgeous and I appreciate seeing water color!! Beautiful cards. I especially like the background on the first card. Gorgeous! These are both beautiful cards! I can't choose a favorite! I am loving all these gorgeous floral images! So funny, I have a rectangle of corrugated card sitting on my desk now just begging to be used! I love it, too. Your cards are beautiful. Love how the first one is loosely colored (that would be my skill level - lol) and the 2nd is just a beautiful design! Beautiful card, Libby! I love this springtime color combination! very beautiful card Libby..love it..those flowers are gorgeous.. Wonderful cards. Love the use of the corrugated paper. Beautiful cards! What a great kit & so many ways to use them with different coloring mediums! Your cards are both beautiful. Thanks for showing a different coloring medium. Wonderful cards. I like the carefree watercolor of the sympathy card. First things first...the corrigator is hilarious!! I kept saving mine for that one perfect time I would need it..and I think I finally gave it away!!! Really pretty cards! BTW.. I could sure use some coloring talent rubbing off on me too..so let me know if you every find someone it works with!! I'm proud to say I still drag out my corrugator now and then, too! I have yet to try this resist ink painting. I keep meaning to. You make it look so easy. I need to have a go. I'm willing to work with you on the 'azalea' blooms! (They look more like a clematis to me.) Whatever they are, I love the way you 'quickly' added paint. I need to give that a try. Now, where is my corrugator? Love the watercolor technique and the colors you used. THe azalea card is wonderful, really like what you did with the watercolors, right over the white embossing? Did you wet the card before the paint? The flowers stood up well. The coloring on card 2 is great, too. The idea of hand drawing stems is great! I'd say you're just as talented as are the others. Don't sell yourself short! Beautiful! I'm so ready for spring flowers! Two delightful cards! I love the different techniques you used, showing how versatile this kit is. I love the colors you chose for each of your cards. Gorgeous! Pretty cards! I like your watercoloring with the white embossing a lot! Just lovely. These cards are so pretty! Thanks for the inspiration! Oh these are so varied and different. Everything about them is just stunning. Oh thanks so much for sharing your great cards! Your cards are wonderful. Thanks for thinking outside the box on your first card. Love it! Love love love your card! The flower is beautiful!!!! Thanks for sharing! I am officially ready for spring! Libby, the sympathy card is very lovely. What a way to express your love for someone else. Pretty cards! Thanks for sharing!!! Very nice your cards, original and stylish. I love!! Gorgeous cards! I love the layering and pretty flowers. Thanks for sharing. wonderful cards, Libby - love how you used different coloring methods - and how neat that you met those other great colorists! Pretty cards, the azaleas work for me. 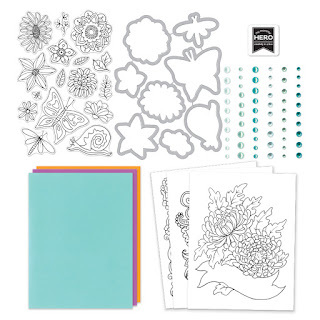 I can't wait to get this kit and start coloring these flowers. 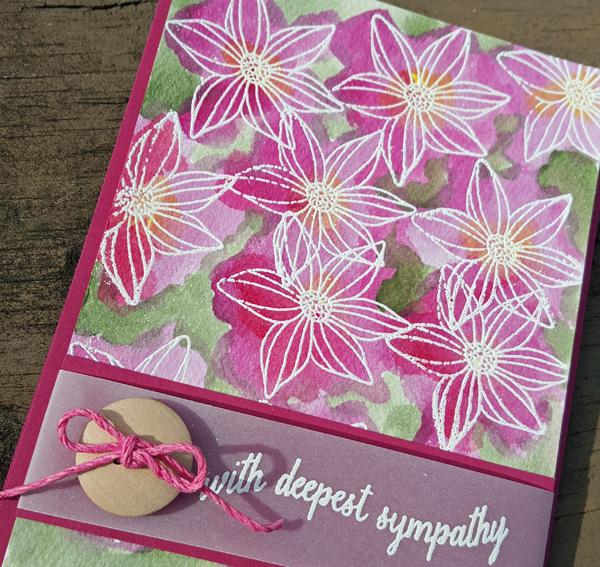 Love the dramatic love of your watercolor and the pretty floral card. Very nice cards! The azaleas look nice with the watercolor look. The purple flowers with the long stems are pretty too. Yes I think I still have the corrugator somewhere. Your write up is fun too! Both cards are so pretty! I especially love the background on that first card!!! Libby, beautiful cards. I like the variety of your coloring techniques-we can't all be Copic queens. Can't believe you live in Marietta, Ga. I was born and raised there. It's great to have a talented artist representing Georgia. I live in Jasper now and love it but I never forget my Marietta days. OOOHHH! I like your techniques! I used to live in GA--Marietta and Roswell--azaleas are gorgeous and prevalent! Good use of those flowers --both cards are beautiful! Gosh your card are beautiful, thank you for sharing! Lovely cards - thanks so much for the chance to win this wonderful kit! ok, so I've seen the corrugated paper in the craft store and wondered how you would use it, then found the tool at Goodwill, and you can't pass up a chance like that, right?!!! So...how did you put it together? Is the blue piece on top of the corrugated piece? That's what it looks like. Thanks for a great idea for using what I (now) have! Beautiful. Hi Bev! Corrugaters unite! :-D Yes, I put the corrugated kraft piece on my card with some super sticky adhesive, since it's not a solid surface. Then the blue piece has a little foam adhesive at the top and bottom so it will go over the corrugated piece. I hope that makes sense. Awesome that you found the tool at Goodwill! !